You've probably seen meat that comes out of the freezer and looks 'off.' It usually looks grayish white and dry like it’s been overcooked. 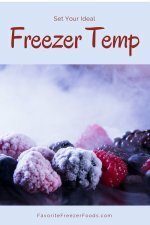 Freezer burn is damage to your food from dehydration and oxidation caused by air. Water evaporates at all temperatures, so water will continue to evaporate out of your frozen food unless there is something to prevent it. That something should be a moisture-vapor barrier provided by your freezer container but there are a few other little tricks of the trade I’m going to share with you. Food with freezer burn is safe to eat, the quality is what suffers. Often you can just cut off the dehydrated part, but if it’s too bad just throw the whole thing away. Wrap your food well in freezer containers. Freezer quality containers have a moisture-vapor barrier that keeps the moisture in your food. This is the best insurance you have for the quality of your freezer meals so don't cheapen out here. Use the proper size containers. Rigid containers should be nearly full with just enough room for food to expand as it freezes. Freezer bags should have all the air sucked or pushed out of them and close fitting wraps such as freezer paper should be touching the food. Vacuum sealers are best for long term storage because they remove all the air from the package. Food storage bags, plastic wrap, bread wrappers and Styrofoam trays with plastic wrap will not provide a moisture-vapor barrier and do not prevent your food from dehydrating. Keep a stable freezer temperature. Yes, it is true that self defrosting freezers are bad for your food because by design these freezers fluctuate in temperature so the frost can melt. This is bad for your food because the temperature fluctuations cause the water molecules in your food to want to move and increase the chances of it evaporating. Keep your freezer at least 75% full. This helps keep the temperature stable and as a bonus it saves energy because the frozen foods keep the freezer and other foods cold. A second bonus is that in the event of a power out your frozen food will stay frozen longer. You don’t have to fill the freezer with food either. You can make ice and keep it in the freezer to accomplish this. Freezer burn seems to be worse on cooked foods because they have less moisture than raw foods, moisture is lost during the cooking process. Freezing cooked food like meat, rice and beans in liquid means the liquid will start to evaporate before the moisture from the food does. You can freeze foods in water to be drained later, broth for more flavor and maybe even to be used in your recipe or in a sauce to be served with the finished dish. The ice dip is one of the oldest ways to protect food. Raw food is dipped in ice, frozen and dipped again. This process is repeated until their is enough ice to protect the food. Fish is often frozen this way. You may also see chicken or other raw meats ice dipped or frozen in a solution. This method is often used by food producers to insure quality and prevent freezer burn while saving on packaging. Repack store bough frozen foods. Do you open a bag of store bough frozen veggies use some and put that open bag back in the freezer? What about the box of fish sticks? If you do you’ve broken the moisture-vapor seal and not replaced it and you‘re just begging for freezer burn. Once store-bought frozen foods are opened they need to be repacked. Putting the whole bag of veggies inside a freezer bag or taking the fish sticks out of the box and into a small rigid freezer container is better for your food. Oxidation is an often overlooked problem with freezer cooking. Air reaching your food can cause fats in meats to oxidize leading to rancidity. It’s also a huge problem with fruits and vegetables as oxidation leaches nutrients from them. The good news is that the same methods that prevent freezer burn can prevent oxidation. Meats: Package in quality freezer wrap or air tight freezer containers. Vacuum sealers are best for long term storage. Fruits: Add citric acid/vitamin C such as Fruit Fresh to your fruits. If they start to oxidize the Fruit Fresh will oxidize first leaving the vitamins originally in the fruit. 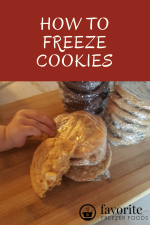 Return from Freezer Burn and How To Prevent It to the homepage of Favorite Freezer Foods.